Our sturdy Walton Hills Panel Bed offers a beautiful sleigh style, with a twist of Early American influence that's sure to have a big impact on your entire bedroom decor. The large headboard is crafted with a raised panel design and a slightly contoured slope, offering a luxurious style that also doubles nicely as a backrest for those that like to sit up in bed and read or watch TV before heading off to sleep. The gorgeous footboard also features this same panel design, surrounded by two arches legs that run down to subtly curved feet, giving you a simple Colonial look that is versatile enough to include in any type of decor. Both pieces are connected to a large, solid wood side panel that incorporates a beautiful molding that flows together with each piece, creating a uniform look throughout. Let us build the bed to suit your needs. Each piece is available in five traditional sizes - giving you the choice to place this bed in any suite. Once you've chosen the size, choose from eight different hardwoods and an array of stains to form the perfect combination to match your existing pieces, or your favorite one to start anew. 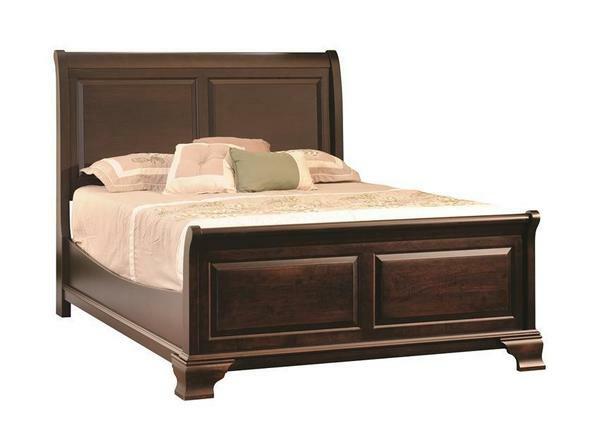 Your new bed will be bench-built by skilled Amish woodworkers, with the utmost attention to detail. The results will speak for themselves when you receive an heirloom quality bed that is sure to be handed down and enjoyed for many generations to come. Floor to Top: 16 1/2"